and what is it good for anyway? Joe Brown, Head of Research and Development, Why Hair Analysis?. Hair analysis provides an accurate assessment of the concentration of minerals in the body—those that are toxic in any amount, those that are essential and those that are necessary in small amounts, but toxic in larger amounts. This non-invasion technique readily determines exposure to toxic substances such as mercury, lead and cadmium. The correlation between mineral concentrations in the internal organs of the body and levels in the hair is much more reliable than the correlation between intracellular mineral concentration and the levels found in serum and urine specimens. Normal trace element concentrations as detected in the serum or urine, may be quite variable; however, hair analysis gives accurate readings of the intracellular levels of these substances. A small amount of hair is removed from the nape of the neck for hair analysis. Because harsh chemical treatment of the hair from coloring, bleaching and perming may result in possible inaccuracies, a pubic hair specimen may be used instead. Before hair analysis, medical practitioners who were interested in the concentration of trace elements in the body had to rely on urine or serum sampling. Unfortunately, these tests have been shown to be inaccurate because they do not measure the intracellular concentration of minerals. In addition to being accurate and easily performed, hair analysis provides a relatively permanent record of mineral concentrations. Computerized information can analyze the correlation between various elements in the hair. A treatment program can then be designed for identified disease states. After hair analysis has determined the intracellular mineral content of the body, the initial results can be compared with follow up hair analysis to determine the effects of treatment. 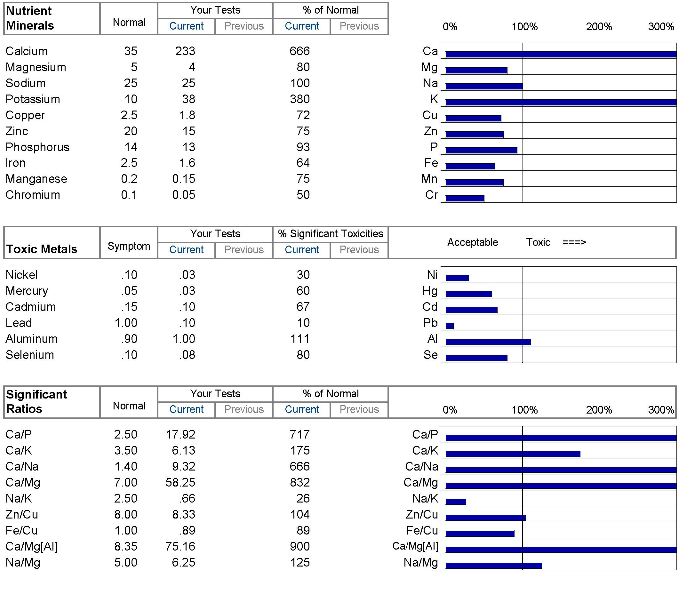 Prior to onset of symptoms indicative of metal toxicity, significant health information can be obtained using hair analysis. Heavy metal intoxication including lead poisoning, is far more common than what has been reported in the media. Hair analysis allows early detection of these potentially toxic elements, often before the patient manifests serious symptoms. Treatment of the problem using chelation therapy and other programs, can therefore be started before the condition becomes irreversible.